Stuart Beavis, as he was generally known, was born in 1880, lived in Edmonton, Middlesex, and, having gained a scholarship, attended Latymer Road School, Edmonton. He became assistant manager of a factory making briar pipes for smoking. His intense belief in the brotherhood of men of all nations led him to study languages and literature of other lands, and for some time he taught French and German at the Working Men’s College, Crowndale Road, north London. 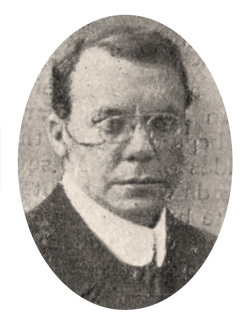 With such humanitarian zeal, and a tendency towards Quakerism, he opposed the First World War and joined the No-Conscription Fellowship, becoming local branch secretary. On 10 March 1916 he applied to Edmonton Military Service Tribunal for exemption from conscription as a conscientious objector, but was allowed only exemption from combatant service; this meant that he would be called up into the Non-Combatant Corps (NCC), guaranteed not to use or even handle weapons, but still part of the Army. Appeal on 4 April to the Middlesex County Tribunal was dismissed, so when the call-up notice came, he ignored it. In consequence, he was arrested on 25 May 1916 by the civil police, brought before Edmonton Magistrates’ Court, fined, and handed over to the military. Taken to the Mill Hill depot of the NCC, 3 Eastern Company, he refused to put on uniform, and, contrary to Army regulations, was forcibly dressed in it, before being taken to Seaford, Sussex, in a NCC attachment to 10 Battalion, the Border Regiment. Stuart was transferred briefly to Wormwood Scrubs Prison, London, for appearance before the Central Tribunal on 14 August, where, because of his intransigence on “bargaining [my] right to dispose of [my] conscience” he was deemed not to be a ‘genuine’ CO and was refused the Home Office Scheme, which he had made clear he did not want, anyway. He was transferred to Maidstone Prison on 27 September 1916, and was the subject of Parliamentary Questions on 15 and 20 March 1917 as to whether there was any useful purpose in holding him in prison. The War Office responded to the effect that the law must take its course; nevertheless, despite his ten-year sentence, Stuart was released on 12 April 1919, under a provision at that time for releasing all COs who had spent at least two years in prison. His younger brother, Walter, was also a conscientious objector, imprisoned but not sent to France or sentenced to death.